Files can be uploaded within a section (week or topic) within a Moodle course. These files can be accessed by your students when they click the link to the file resource. 1. Log on to Moodle and open the desired course. 2. Click the Edit button in the upper right side of your screen. PLEASE NOTE: There are two different ways to complete the next step depending on which view you are in. If you see two separate drop-down boxes, click Add a resource and select File. For more information about this option, view Activity Chooser Options. 3. Click the Add an activity or resource link within a section. Select File at the left and click Add at the bottom. 5. 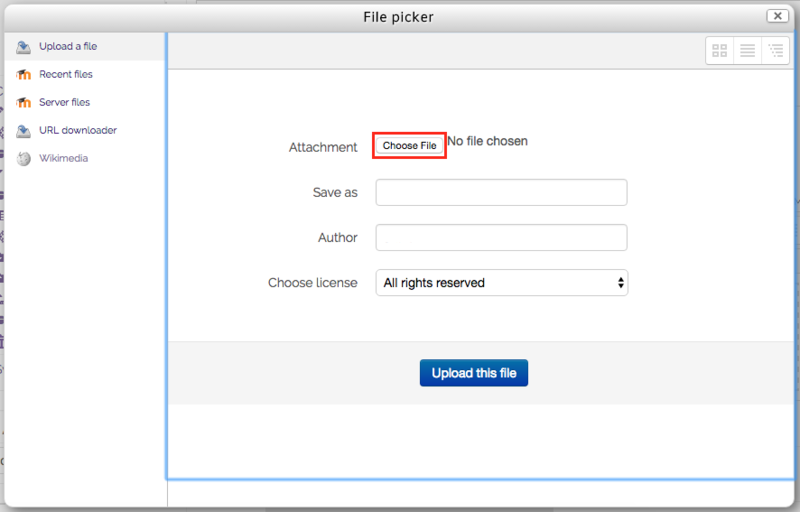 Click the Add button in the Content area next to Select Files to open the File Picker window. Otherwise, you can drag and drop the file into the designated area and skip to step 8. NOTE: You should only add ONE file. (Even you add multiple files, it will only display the first. To add multiple files, see Moodle 3: Activities & Resources: Add and Manage a Folder. 6. Click the Choose File button in the center window. 7. Click on the Browse... button to search for the file on your computer. 8. After you have selected the file, click on the Upload this file button. 9. Click on the Save and return to course button at the bottom of the page.